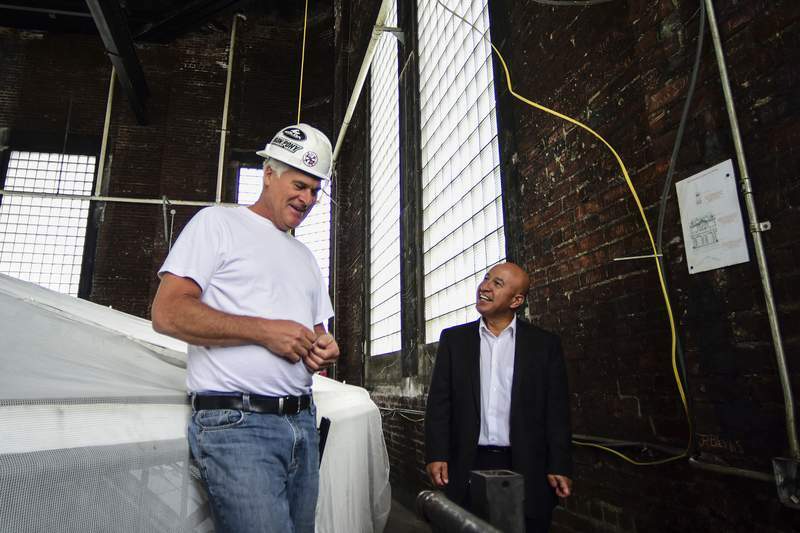 Mike Moore | The Journal Gazette Allen County Government, Director of Buildings and Grounds Vance Hernandez, right and General Restoration Corporation project supervisor Chuck Magnusson, left joke about climbing the stairs at their age to get to the top of the Allen County Courthouse on Thursday. 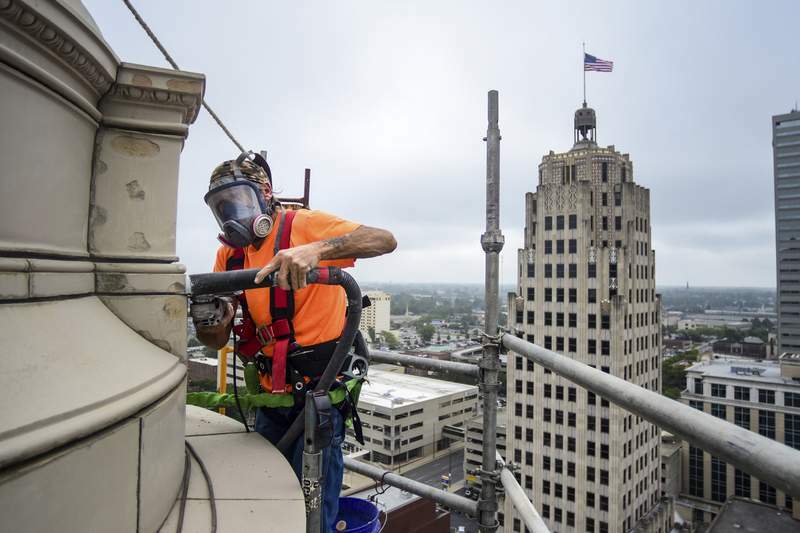 Mike Moore | The Journal Gazette General Restoration Corporation employee Danny Lawrence chips away mortar with a chisel and rock hammer during a restoration project on top of the Allen County Courthouse on Thursday. 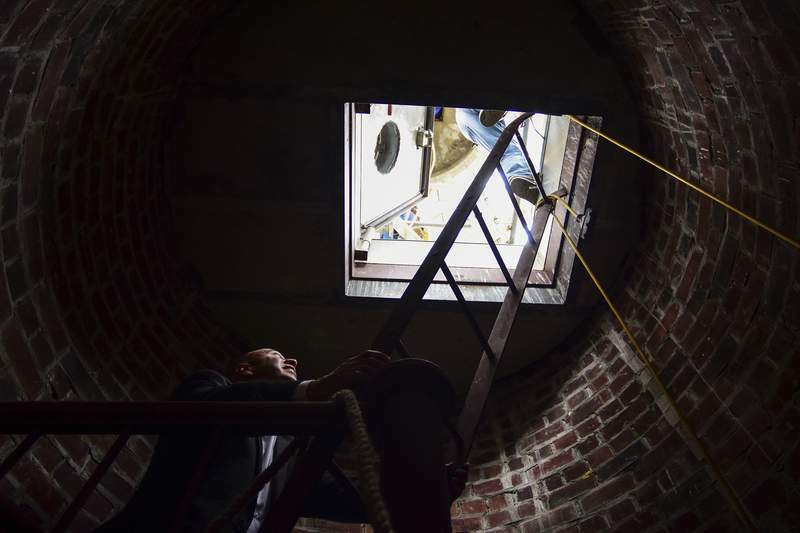 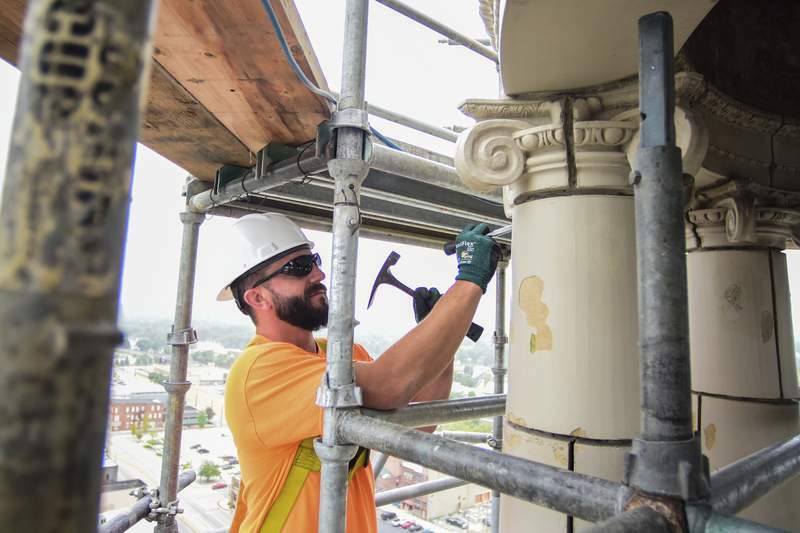 Mike Moore | The Journal Gazette Allen County Government Director of Buildings and Grounds Vance Hernandez waits to climb a ladder to the top of the Allen County Courthouse where a restoration project is currently underway. 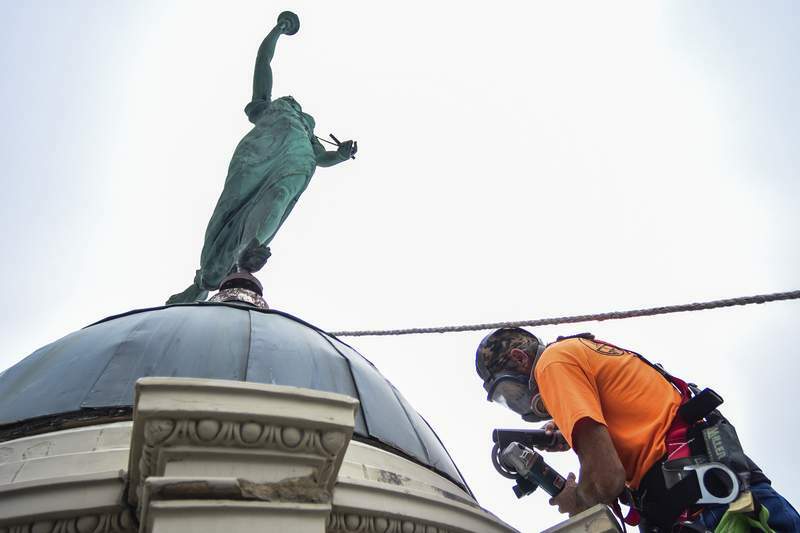 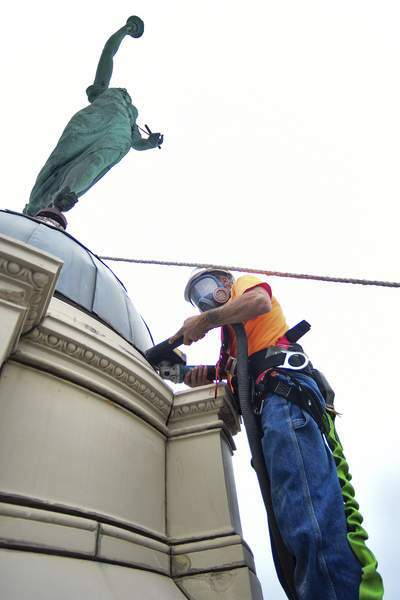 Mike Moore | The Journal Gazette General Restoration Corporation employees work on scaffolding two hundred and fifty feet in the air above the Allen County Courthouse to make restorations to the platform where Lady Justice stands. 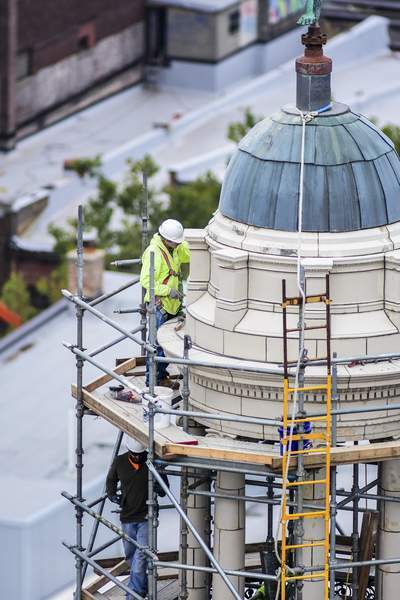 The project is expected to take approximately six weeks to complete. 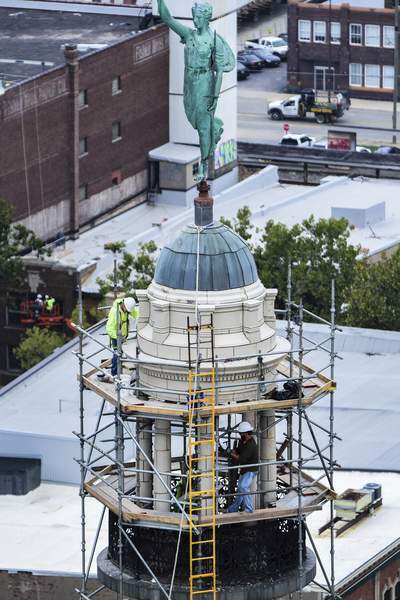 General Restoration Corporation employees work on scaffolding two hundred and fifty feet in the air above the Allen County Courthouse to make restorations to the platform where Lady Justice stands.